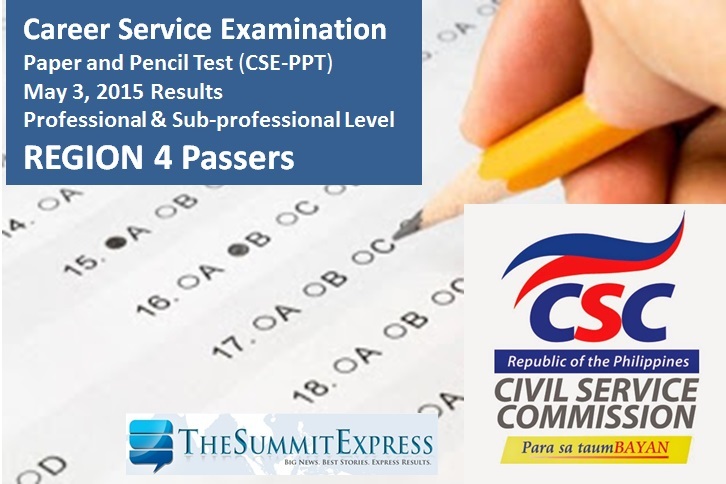 MANILA, Philippines - The Civil Service Commission(CSC) has finally announced the complete results of May 3, 2015 Civil Service Exam- Paper and Pencil Test (CSE-PPT) also known as Career service examination on Friday, June 12, 2015. The complete list of passers for Professional and Sub-professional level for Region 4 (CALABARZON and MIMAROPA) are available on this page. The CSC said that 157,041, comprising 86.92% of the total number of examinees took the Professional level of examination while the rest tried to hurdle the Sub-Professional test. The Southern Tagalog (Region IV) has the biggest number of examinees at 26,509 or 14.67 percent of the total number of examinees. CSC named a total of 2,199 and 441 passers for the professional and sub-professional level respectively.